The birth of Christ was a turning point. All of history can be divided by events that took place before and after Christ. 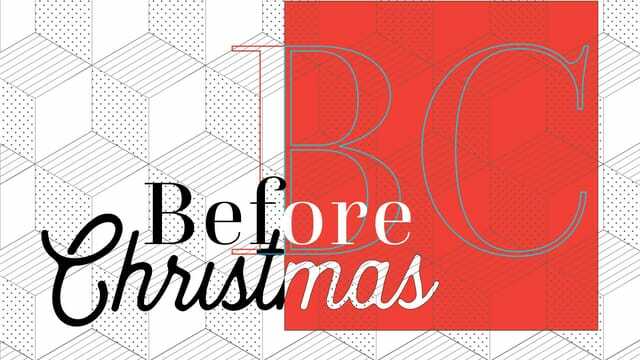 This series will explore the birth of Christ through the lens of the original Old Testament. Long before Christ was born, the Christmas story was presented by prophets sent by God. This holiday season, we’ll focus on those stories and learn how we can apply them to the present. http://www.theridge.church/studentschristmasparty Tuesday, December 18th—Middle school and high school students are invited to join the Ridge Students team for a fun and festive Christmas Party! You’ll get to spend time together and enjoy the holiday season with a service project, movie, and gift exchange. Find more details and register online! http://www.theridge.church/christmas Join us this Christmas for carols, the gospel message, surprises and laughter! Invite your friends and family to any of the five services! Everyone is welcome on Thursday, December 20th at 6pm, Sunday, December 23rd at 9am and 11am, and Monday, December 24th at 3pm and 6pm. Visit us online for more service info, serving opportunities, and more! You're invited to join us for a special acoustic worship set and a special message on Sunday, December 30th! We will be offering only one service at 11am. There will be NO 9am or 5pm services, and Ridge Kids programming will not be available. Children of all ages are welcome to join their families for the service. Problem: We don’t really understand the meaning of Christmas. Solution: Christmas is about setting us free. Today's Takeaway: Christmas is about setting people free.